Show your kitchen off by updating the look of it with this stylish, durable Vigo faucet. Includes a spray face that resists mineral buildup and is easy-to-clean. Vigo finishes resist corrosion and tarnishing, exceeding industry durability standards. Choose between an aerated flow or a powerful spray on the VIGO Milburn Pull-Down Spray Kitchen Faucet with a 3600 swivel spout. Solid brass construction with a combination of stainless steel and matte black finishes make the dual-functioning kitchen faucet durable enough for everyday use and a beautiful statement piece in any kitchen. 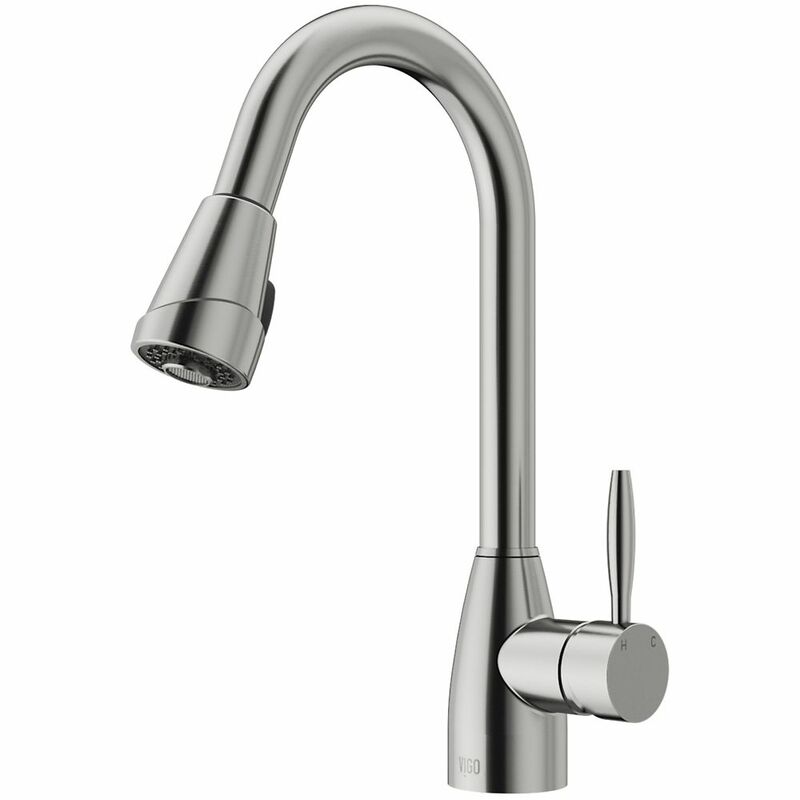 Stainless Steel Pull-Out Spray Kitchen Faucet Show your kitchen off by updating the look of it with this stylish, durable Vigo faucet. Includes a spray face that resists mineral buildup and is easy-to-clean. Vigo finishes resist corrosion and tarnishing, exceeding industry durability standards. Stainless Steel Pull-Out Spray Kitchen Faucet is rated 4.5 out of 5 by 96. Rated 3 out of 5 by Ss_can from Good faucet It’s a good faucet. The biggest complaint would be that the supply lines are too short. Had to buy extensions just to connect to the valves at the bottom of the cabinet. Also wish the pull out had a magnet or something easier for it to snap back into place. But other than those things it’s a good faucet. Rated 5 out of 5 by tluffman from Beautiful faucet I bought the matte black Vigo Pull-down spray faucet for my kitchen reno and I absolutely love it! It is sleek and the matte black finish doesn;t show water marks and it works spectacularly! I would absolutely recommend! Rated 5 out of 5 by Jaybabe2 from Looks and works great!! Looks and works great!! Rated 3 out of 5 by Sweetpea from Looks great, failed after two months We like the looks. All of a sudden the water pressure is half what it should be. I've emailed support. It's only two months old and malfunctioning. I anticipate Vigo will fix or replace but then will it happen again. Disappointed. Hard to fill a pot or do dishes like this. Rated 5 out of 5 by swainjer from Easy to install! After a long search for just the right faucet we landed on this Vigo matte black pull down faucet. It was say to install and the features are great. Rated 5 out of 5 by L Rod from Exactly as described. The VIGO Graham pull down spray faucet we bought was flat black. It was beautifully packaged. It was professionally installed and has been working great for about 2 months. Awesome, well made product. Rated 4 out of 5 by Amateur plumber from Poor start, good finish. The handle fell off for some unexplainable reason. Vigo replaced it quickly.